I believe that there's a karmic reaction to everything that we do. 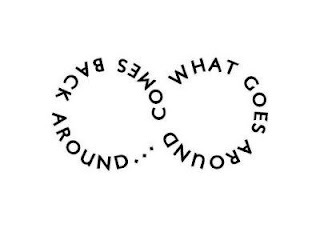 Do good or bad and it'll come back twenty-fold (or more). This I've been told. When something bad happens, people believe that it's a punishment for something negative done in the past. Retaliating and revenge continues the karmic cycle. It is said that genuine forgiveness and acceptance prevents the negativity from happening again. At the end of the day, it strengthens relationships. Last year, a family friend died after getting hit by a car. Freak accident, really. Her family accepted it as her fate and karma. To avoid negative karmic repercussions in the future, the driver was intentionally freed from any charges by the family. I was so bothered by this. Where does one's moral responsibility fit in the picture? It's an internal struggle, really. Conscience or fear of Karma? If you ask me, it's following one's conscience to do the right thing and for the greater and common good of all. This, above all, will reap good karma. I hope I'm right. I Haven't Been Dating... Now What?